A misogi performance at Kanda Myōjin in Tokyo. 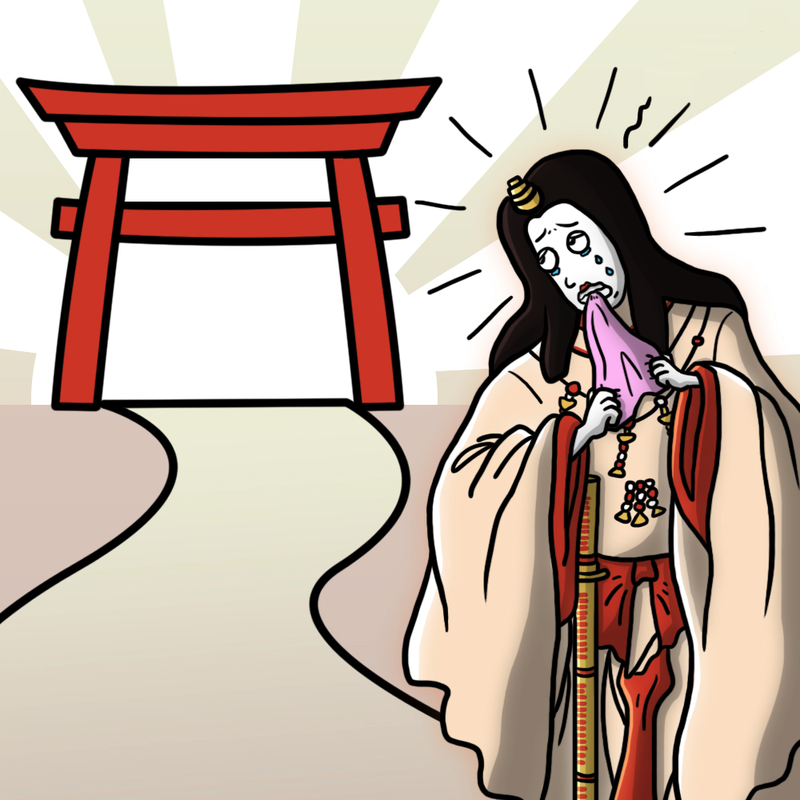 Misogi (禊) can loosely be translated as ritual purification by cold water and is a practice most strongly associated with Shintoism. It is also performed by practitioners of Shugendō, a syncretic ascetic sect with a long history in Japan, and by martial arts groups, such as Aikidō practitioners. 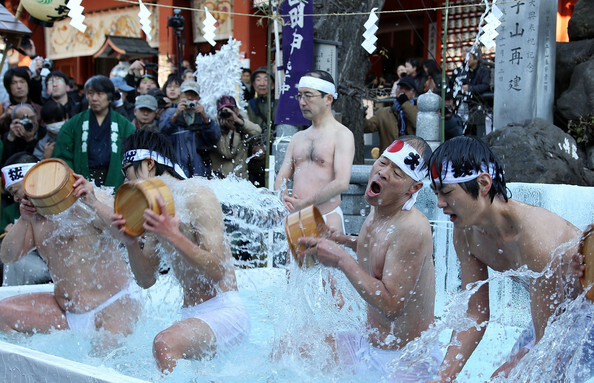 The precise practices involved vary; at some locations the misogi is performed by immersion in streams/pools and at others by sitting or standing under waterfalls, sometimes the event involves collective practices by large groups (up to 200) and sometimes it is a solitary performance. 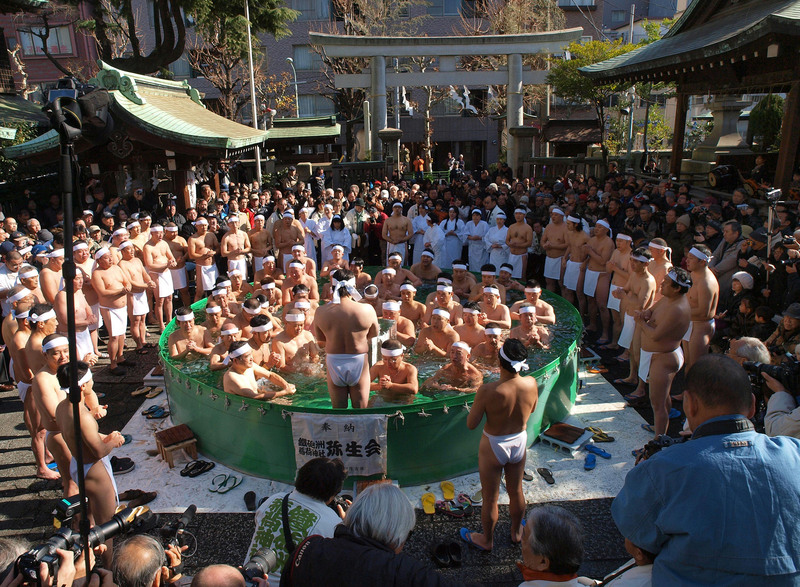 But despite such diversity a clear unifying thread to all misogi practices is the endurance of cold water in order to purify oneself and by extension the surrounding community. I’ve now participated in two misogi events: the first was held last year, in a small town called Kikonai in Hokkaidō in Northern Japan and the second was performed just last week, at Teppozu Inari Shrine in a suburb of central Tōkyō. Both events were spectacular and I was extremely fortunate to be invited to take part. However, these two events were also very different and I think they serve as a good illustration of how a single ‘type’ of ritual can be expressed differently, even when performed within the same country (Japan) and ostensibly within the same tradition (Shinto). In this first post, I’ll focus on my experience at the misogi in Kikonai last year, then in the next post I’ll make some comparisons with my experience at the recent event in Tōkyō and finally, I’ll relate both experiences to some important theories which I think help illuminate and explain some of the psychological aspects of these ritual performances. Firstly I would like to ask who the critics of the Bujinkan are and the sources that you have for their arguments against the Bujinkan? Not because I don’t believe you, it seems totally plausible criticism but I would like to know the source of this reference as you do not specify. I have been involved with martial arts for about 10 years first practicing Wing Chun Kung Fu then Muay Thai and currently I’m training in Brazilian Jiu Jitsu and Judo. I also served as the president for the Thai boxing and Brazilian Jiu Jitsu sports societies at university so I have quite a bit of personal experience with martial arts communities and criticisms and discussions of other arts are common in such communities. However, my main source for the arguments against the Bujinkan I presented is the large martial arts discussion forum ‘Martial Arts Planet’. I have been a member there for over 5 years and over the past year or so I have also become involved with moderating the site. At first I moderated the religion and the Thai boxing forums but for the past few months I have also took over moderating the Ninjutsu forum. As a result, I have read more discussions about Ninjutsu than probably most practitioners have and many of those discussions have revolved around criticisms. So that is the source from where I draw the criticisms from.